Meet new people/Make new friends: for “Strangers are just friends you haven’t met yet” (generally attributed to Actor Will Rogers, n.d.). So if you are new to the area, your friends have moved away, or you are finally in a phase of life that allows you time to cultivate new friendships, volunteering is a great way of finding others with a common interest. Strengthen current friendships or family connections: by encouraging them to volunteer with you. Get healthier: for according to the University of California San Diego [UCSD] (2014), moods and emotions like optimism and joy “strengthen the immune system”. In addition, according to the Center for Disease Control and Prevention (2013), “…maintaining social engagement, and participating in intellectually stimulating activities” helps keep your brain active and lessens the risk of memory impairment such as Alzheimer’s Disease. Promote personal growth and self-esteem: as you develop empathy, gain additional abilities to work in collaboration with others and discover your self-efficacy (UCSD, 2014). East Valley Wildlife (EVW) has many knowledgeable volunteers and have periodic training sessions to help you gain skills needed to be successful. Temporarily forget your troubles: It is true that volunteering will not rid your life of all troubles, but it may help provide you with an opportunity to focus on something else for a little while. Gain professional experience: Having volunteer experience on your resume lets employers know that you have a passion and enthusiasm for that subject area so much so that you are willing to give of your time and talents. For those of you that are thinking about majoring in or those of you who have majored in subjects similar to Veterinary Medicine, volunteering with EVW may be a chance to see if you will like your major or what area you may actually like to specialize in. Finally, for those of you who need references for a resume or application, one of the best ways to find a good reference is to make those connections even before you need one and then you have them when you do. Childlike wonder: Get that Christmas-like magic back when you see the birds and small mammals in your care do something charming or remarkable. A sense of accomplishment: You can know that you made a difference. Volunteering with EVW is flexible: What I mean is that you can volunteer from home, at someone else’s home or at a community event. 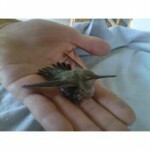 You can provide hands-on assistance by directly caring for birds or assist EVW with another specialty and passion such as drawing, painting, writing, marketing, raising money, computer graphic design, or photography. You can help simply by providing encouragement to those who are caring for hundreds of babies during the baby bird season such as by setting up a time with certain volunteers to drop off meals, help them with their dishes (as making baby food for lots of baby birds really causes your dishes to stack up), or write notes of encouragement to those volunteers. The best part is that this is not an exhaustive list. If you have other ideas or ways you could help please let us know! In summary: Just as each bird is created with their specific beauty and special qualities so is each person created uniquely with their own beauty and qualities. No one can complete certain tasks and help East Valley Wildlife quite the same way you can. We would love to hear from you. Recently returned from South Dakota. Spent an idyllic week in a log cabin near Custer State Park for a conference. The wildlife was awesome…I mean LARGE wildlife, like tons of bison roaming free (or freeish) in Custer State Park. It snowed the second day I was there and the native South Dakotans said that it was really rare for snow that early in September. Visited Mt. Rushmore, of course, and another impressive memorial work…The Crazy Horse Memorial. I suggest a visit and make sure you partake of the brief movie in the visitor center. You will leave the movie with a very different perspective of the amount of work that has been accomplished and remains to be done on the memorial. 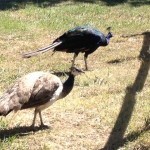 I added a photo of some interesting “wildlife”, peacocks! 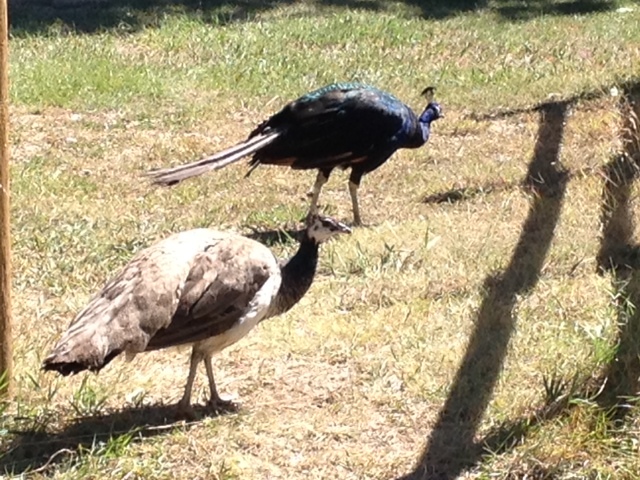 Not sure if they are indigenous or just found their way to the area. Also saw some wild turkey…BIG birds, but too skittish to get a good photo of them. COMING NEWS….We will soon have a guest blogger! Looking forward to her new “voice” in this blog. If you have any interesting ideas for a blog, send me a comment.